Plenty of people try to stay vigilant about their health and watch for signs that they might be coming down with something — but who has the dedication to watch their heart rate, skin temperature and other signs all day, every day? Probably no one — unless their smartwatch does it for them. A team of researchers led by Stanford’s Michael Snyder has just published results from a long-term experiment looking into whether these vigilant wrist-based gadgets can help both diagnose and monitor disease. Forty-three people participated in the two-year experiment, during which various measurements were taken regularly and correlated with real-world events like travel, sleep trouble, sickness and so on. What they found was that, generally speaking, smartwatches may be a very useful way to monitor general health — as long as their role is carefully considered. 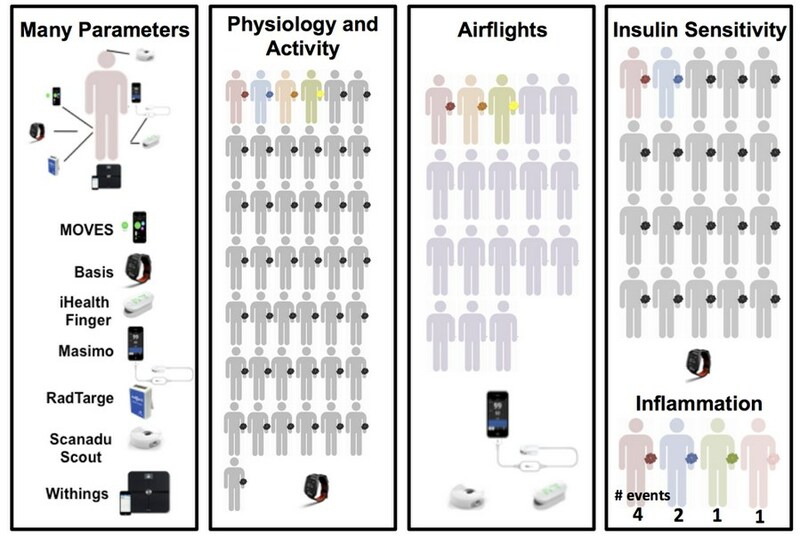 A diagram from the paper shows the different devices and activities tracked by the experiment. For instance, during air travel, people tended to show lower blood oxygen levels, resulting in fatigue. The onset of Lyme disease was able to be tracked, and individuals’ sensitivity to insulin (and thus risk for type 2 diabetes) was also evident from the physiological measurements. You may be able to tell when you’re getting sick, but the watch might tell you hours or days before you’d have otherwise noticed. It wouldn’t be a diagnosis per se, but simply a warning that its readings are outside the norm — so try to get a good night’s sleep and maybe you can head off that cold. The team is currently working on creating algorithms that could do this reliably.